Would you leave your dog outside of a store or building tied to a pole, especially if you lived in a big city? If you live in some sleepy little hamlet, maybe so, but some people wouldn’t even do it then, particularly if they had a small or what is considered a desirable breed of animal. For the most part, it’s just not safe. Add to that it’s illegal or frowned upon in many parts of the country, and it’s a big fat no go. But it happens often enough. 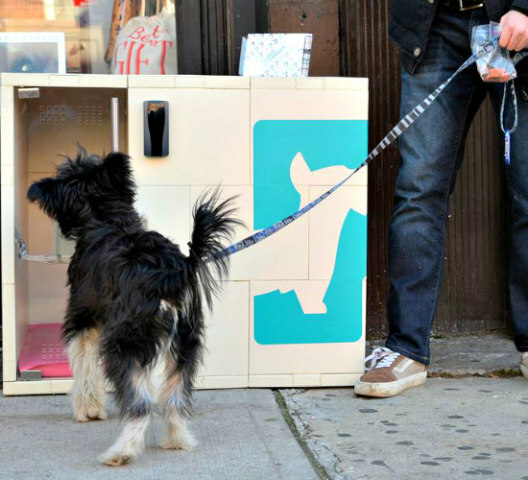 That’s where Dog Parker comes in, a climate-controlled waiting station for busy pet owners on the go. 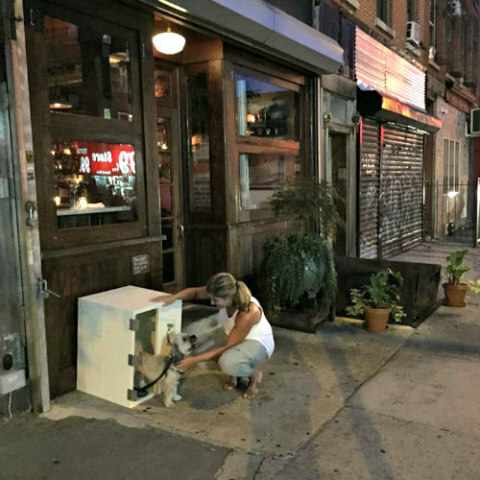 Last year a company out of Brooklyn, New York, came up with an idea for a secure waiting place for dogs accompanying their owners without admittance to the facilities they enter. Let’s face it, very few places welcome pets that can’t be carried in a purse or tote bag, and even then they’re not always enthusiastically welcomed. 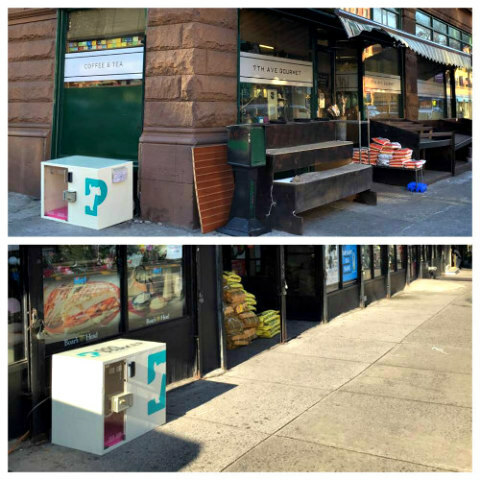 With that in mind, Dog Parker founder, Chelsea Brownbridge, came up with the idea of sidewalk crates that can be stationed in various locations and used by online subscribers to the service. You just need to download the app used in conjunction with the crate service and pay a $25 annual fee for the privilege of using one. The app allows users of the service to monitor the interior climate of the crate and keep an eye on their pets remotely (via video feed) while they’re away. It costs .20 cents per minute, and there’s a three-hour maximum time limit on the crates with a fee of $5 for every minute you pass the three-hour mark. If you haven’t picked your pet up within a half hour, the dog is purportedly picked up and brought to a boarding facility where more fees will be applied. All of this really isn’t that unreasonable, but would you place your pet in a dimly lit box and shut the door like a bus station locker and then leave them there to stress out alone wondering if you’ll ever return? A lot of people are aghast at the idea. Unless you’ve got a pretty unflappable pooch, the chances of them getting out of the box without being emotionally unscathed is probably nil. This calls into question the ethics of leaving an animal locked up like this and not understanding what’s happening to it. Dogs stress out when you leave them outside of a place of business just watching you go in the door after leaving them behind. They’ll whine and pace and become nervous and agitated while straining at their leash. Sometimes they’ll do this even if they can see you through the window. Another major concern would be the risk of spreading diseases. While dogs enrolled in the service must be current on their vaccinations, they can pick up all kinds of illnesses just by coming into contact with other animal’s bodily fluids if they're not, and they don’t even necessarily have to be fresh. The range of diseases they can contract that way is actually quite startling. Sadly, a lot of them can lead to death, not to mention the hefty vet bills you’ll incur trying to save their lives. It’s unclear at this point exactly how often they’re sanitized — which should be after every use — but you’re still counting on the process to be effective, if it’s done properly. To be fair, some dogs might really not have a problem with this, and Brownbridge has stated that the average time a Dog Parker user checks their pet in is only between 10-15 minutes. She also noted that animal advocacy groups have been contacted for feedback or input on the service. So far, the five prototypes the company has deployed have been successful and very well received, so much so that they have plans for expanding the number to 100 soon. While most professionals warn against bringing pets with you if they can’t come inside, this might be a viable short-term solution for providing a safer environment than leaving them on the street. What’s your take on a program like this? Would you use it if it came to an area near you? Weigh in below in the comment section. We’d love to know what you think. Don't Piss Off the Monkey -- The Animal Video of the Day!! !